Not turning her head for a moment, Raven smirked seeing that it was true. Holding the knife still in her hand, she stands up looking at David with her bright green eyes. But when she tried to use her abilities by looking into his brown eyes, she found that it didn't work. This made her annoyed and angry, but her face remained calm. "Hello. are you the one the Dragomir's call David?" She decided to play with his head to screw with him like she does with alot of people. "Strange, how Sessi didnt' kill you but she killed your mother. Hm.." She taps the side of her face with a finger. "Too bad...My love will take care of the mess she made." She knelled back down to cut the body where the bite marks were. David stared fiercly into the stranger's green eyes. It definitely wasn't Sessi. He ignored her question and instead responded, "Are you the one they call murderer?" he asked, his voice on the edge of fury. "Or intruder? Or dead?!" He was nearly yelling at the end. He'd seen what she was doing as he talked and already lurching toward her. "Get off of her!" He went to push the girl away from his mother's body. Vladimir began heading back into town, keeping to the shadows as Raven looked at David with a frown on her face. She kicked him in his side. "I have to do my job, Vlad gave me." She made sure her kick was hard enough to knock him over. "Unless you want to join your girlfriend and mother in the cemetary?" Raven frowned; she quickly cut where the bite marks were and then jumped back. Knowing that he was dead anyway when her lover comes; backing up with the knife still in hand she wasn't taking any chances with the human. Her goth appearance would make some think she enjoyed death, but in truth she love Cemetaries. Stopping in a doorway she noticed that she had left the backdoor open. David never managed to lay a hand on her. She kicked him away, making him stumble backward wiuth his hanmd clutching his aching side. He tried to move toward her again, but something huge and heavy brushed past him, sending him sprawling. He landed on his side with his arm crumpled beneath. He watched a dark canine shape leap off the floor over his mother's body and tackle the human girl to the ground. It ripped the knife from her hand without effort and tossed it to the side. Two more wolves leaped in through the windows and stood crouched on the floor. One grabbed the back of David's sweatshirt in its teeth and hauled him to his feet where he stood, shaking. The first wolf still stood over the girl, giving it a death glare to warn her not to move. suddenly Raven's cellphone began to ring, and the tone is something that would belong to a executioner. Fear came upon her face as she is scared of wolves; her body pinned down and then the phone went silent. And like that a figure stood in the door with a dark haired vampire corpse over his shoulder looking at the wolves. His eyes widened as he didn't like a pack of wolves around his lover. "Vladi." Raven went silent as she was too scared to finish. "Get off of my lover. We killed what we came for." Vladimir spoke as he tossed the body into the room. "This is none of your concern, wolves. But the human knows so he must die like his girlfriend here." Vladimir kicked the body over as Sessi looks at the room. she could see everything but couldn't move. Seeing the images and the wolves, her eyes were scared not for her but for David as she felt like no friends were in the world now. "They exposed our kind to the humans. Thus, the punishment must be given." Vladimir tried to justify what Raven was doing and him as well so that the wolves leave his lover alone. He could take on one, but not three and knew that Raven would be killed if she tried. The wolves remained perfectly still, knowing perfectly well that another would join them soon. And sure enough, Vlad entered the house as if on cue. The human girl spoke beneath him, so the first wolf finally took notice. He pulled himself a little less out of her face, but remained standing over her to prevent her from getting up. The wolves' eyes followed the seemingly lifeless body fall to the floor, then snapped back up to Vlad's face. They cared nothing for the girl. David, however, recognized Sessi and made a soft disbelieving noise. He moved to go to her, but one of the wolves still held him in its grasp. It whined softly. It was Vlad's next statements that caused instant uproar. The wolves didn't mind being called wolves, but they did mind him killing David. All three wolves broke into simultaneous growls at his words. The wolf that held David looked at the one standing over Raven, the leader, who nodded in approval. The wolf smirked a wolfish smirk and let go of David in order to throw itself at Vlad. It's front paws dug their claws into the wall behind, braking right through. It didn't so much as touch Vlad, but it now had him pinned against the door. Standing on it's hind legs, it was nearly as tall as Vlad. "You will not touch the boy," it spoke in a clearly feminine voice. David, meanwhile, had crawled over to Sessi's body, but stopped at the sound of the wolf's voice. The girl I kissed... he thought. Turning back to his task, he reached Sessi on the floor and knelt beside her. "Sessi..." he murmured, tears in his voice and in his eyes. "It's my job wolf." Vladimir snapped back as Raven found that she was confused about what was going on. With a smirk on his face, Vladimir used his speed to kick the wolf off of him and shock the hound through the bareskin in the ear. "Unless they can explain how all that was told to me is a lie." vladimir frowned. "Now let go of my lover. She was making this look like a robbery gone wrong. Not a vampire attack." His voice deep and dark sending chills down anyone's spine. He wasn't going to stand for this, but he wasn't also going to pick a fight with all the wolves in the room. Though he was confused, the one he met before had walked alone and now he is looking at a pack. Sessi's eyes finally moved up to David as a tear fell from them. she felt so helpless as she laid there looking at him. She didn't want him to see her like this, her mind is confused about what is going on. Through Vladimir's mind she could see one thing, but in Raven's human mind she could see fear. Only vague thoughts came from the wolves; she has never meet one in her lifetime. Turning her eyes up to David sadly, she couldn't move her body. First time ever rendered vulnerable. The female wolf felt the shock, but it was nothing too major. She landed on all four feet, shaking off the shock. The second wolf nipped her muzzle to rebuke her poor concentration. She growled and glared at Vlad. "Consider yourself off duty," she snarled. The other wolf decided that Raven was not much of a threat and got off of her. He snarled at the female wolf. "Watch it Megan. You'll get yourself into trouble." She did not protest, but whined softly and bent down to the ground a little. The wolf now turned his attention to Vlad. "In truth, we don't give a (insert naughty word here) about what this attack appears to be. he advanced upon the vampire, stepping over Sessi and shooting David a warning look. "We will defend the boy to our fullest extent. I doubt you'd like to risk her-" He swung his head to look at Raven. The other male wolf leaped and her obediantly and pinned her again, stopping her from any attempt to get up she would make. He slicked his chops and snarled. The Alpha continued, "just to murder an inncoent boy now would you?" Vladimir stood down and looked at the female wolf standing aside. "Give me Raven." Vladimir frowned. He looked at David calmly still not realizing that Sessi is still alive. Raven stood there scared knowing that one day she will be walking with her lover doing the same thing. 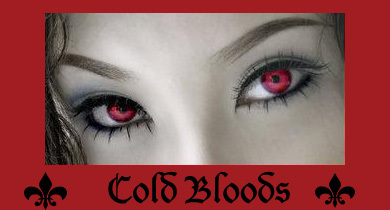 They may not be kings or rulers but they try and keep the vampire world a secret. Even though Raven is a human, Vladimir made a deal with her that he isn't going to back out of. "Human boy. Tell me then. If Sessi's words are true. Then I will have to do alot of make up for killing my friend. Did she really kill your family and did you expose us? If this is all false then the one whom made the accusations will be charged instead." Vladimir said as he is not willing to lose his love over this mess but had to know the truth. Sessi looks up at David sadly still unable to move, she wanted to say something but couldn't. David didn't look at Vlad. What difference did it make if he was sorry for killing the wrong person? What did it matter that he would want to make it up? He could never make it up. Never. "No. I was with her the whole time and the kill was..." he sniffled and hesitated. "The kill was fresh." He thought back and tried to forget his grief for the time being. "She said it was her sister that did it. She said it was Maria." His voice quavered at the end and he gave up speech. He didn't know what to make of the second question anyway. What had he done wrong? The wolves watched David when he spoke, but looked back at Vlad when it was clear he'd finished speaking. "Satisfied?" they demanded. The one wolf did not let Raven go. Instead he placed a paw on her belly, extending his claws threateningly. "Very. I am sorry, I'll take care of this mess. Maybe I'll let you watch the execution." Vladimir frowned as he moved aside to grab his lover. Angry that they are hurting his Raven; "Now let her go." He is willing to reach right in their mouths and grab their tongues just to shock them badly. "Unless you want me to bite the boy to change him right here and now." Vladimir frowned not willing to allow this to go any further. He grabbed David's ear sending a small jolt into David's body. "Hurt her. and same happens to him." Gaining her voice back and a little bit of her hand muscles Sessi looked up at David and then at the wolves, this was confusing her. Staring at everyone in the room with her eyes, she looks at David wondering if what the wolves are is what has been wrong with him lately. Why he lied to her yesterday when he was taken. "No..." Her voice was still a little crackled like almost as though no one could hear it yet with human ears. Feeling the small jolt now in his system. The wolves growled, watching his every move very carefully. They forgot to worry about David who was frantically trying to drag Sessi's body out of harm's way, but having little success due to his hysteria. A surprise jolt of electricity whipped through his body. he yelled and lurched backward. The shock was gone, but his hair stood on end and now he was shaking from the aftermath. Without wasting time, two of the wolves, Alpha and female, lunged at Vladimir. They caught him on each shoulder, their combined weight flung onto him. "Steve!" called the other wolf, Adam. Steven paid no attention. He was the Alpha and had his own job to do. "Now you've gone too far pal." THey held Vlad down, focusing most of their energy to denying his power entry to their bodies. Getting zapped would not be helpful right now. "Now Adam," Steven called, his wolf teeth clenched in effort. "Stay down," he instructed Vlad. Megan removed herself and trotted over to protect David who was still terrified, kneeling near Sessi. Steven glared at Vlad. "You are a man of justice are you not?" he asked, no trace of his prior fury in his voice. Watching the whole thing, Sessi lay there shocked as she slowly regained feeling in her limbs again. Raven lay there still shocked that Vladimir is taking this, but knew that her love has a thing about wolves. But Vladimir knew a little weakness to their wolve bodies, did not move though in fear of losing Raven. Looking up, Sessi finally was able to move her arms wrapped around David’s chest lightly hugging him. “No more dead bodies. No more chaos today.” Sessi said sadly. “There has been too much lost.” Her voice crackled a little before returning to normal. “Please no more fighting. Let‘s just get out of here, David. I‘ll run with these wolves with you, but no more fighting today…” Her honey eyes look at all the wolves and then back at David. Raven looked at the woman she once knew as a child, holding a human begging for the fighting to end. This was not the same vampire that she saw, Sessi seemed more kind and sad that in command like she was with her family. Her bright green eyes looked at Vladimir trying to reach out to him for help. With her love being pinned down, he could not reach for her either. His powers were useless right now. “You know the police will show up soon.” Raven grinned trying to bluff. “I’m not sure being seen like this is a good idea with a dead body in the hall. You wolves will get others hunted as well as yourselves if I tell them that you attacked the human female.” Raven said thinking of a way to get them out of there. Vladimir had forgotten about the humans called the police since he has never really had run ins with such people only hearing about it from others and seeing them arrest people. Looking at the wolves though Vladimir wasn’t moving a muscle. Sessi read the fears of Raven and Vladimir’s minds, she continued to hug David not moving as she stared at the wolves. She could vaguely read their minds, but she didn’t move her head from David’s chest. Then she made up her mind that if David went with them, she would pledge her honor to following under the command of the alpha as long as she was with David she was happy. Going to kill her sister, but happy none the less. David looked down at Sessi who was moving. His caught breath let out with relief. She wasn't dead. He pulled her into his lap as soon as he realized and scooted further away from the fighting. He didn't want fighting either. he scanned the room, but the wolves weren't listening to Sessi. He spoke up in a quivering voice. "Hey guys, it's fine. We don't need to-" All three wolves turned their heads and growled at him in unison. He dropped his head and spoke no more. He looked helplessly at Sessi. Adam kept an eye on Vlad while Raven talked, but her words did not overly bother the wolves. They could be out of here within seconds, what could the police do to them? Put them on trial? He chuckled at the thought. Steven saw V;ad's careful stillness and he backed away, letting Vlad stand. Vlad had let them keep their feet when he told them he would kill both Sessi and the boy. "Now," he began in a perfectly eased tone. "You are a man of justice, correct?" he asked forcefully. This vampire supposedly carried out the law. This Sessi was his friend and he tried to kill her because of a false accusation. "You killed two of ours..." the wolf spoke slowly, watching Vlad. "We shall kill one of yours. How's that for a good deal?" Megan, who was standing near David still, tensed in preparation. Adam's claws flicked out of the grooves in his paws. Sessi looked at everyone as Vladimir stood up. Calmly Vladimir realized the wolves were asking him. Bright green eyes look at the ground as Raven didn’t want the wolf on top of her anymore. This both Sessi and Vladimir knew, Sessi’s legs curled up cause she didn’t know what the wolves were going to do. She couldn’t only pick out a few things from their minds. Her arms wrapped around David a little tighter as she didn’t like the words in Megan’s head or voice. “Yes. I use to torture those who knew or told in Romania.” His accent shined through rather strong for someone who hasn’t been in Romania for twenty years. “The one who made the accusations will be dealt with in the same fashion as Lady Sessi was as I see that she is alive now.” His frowned stayed there. “but much much worse.” Those words that rolled out of his mouth scared Sessi, seeing his thoughts of killing the Dragomir family instead of just one person. She knew that they all would fight him, but most likely fail. But as soon as he moved close to Raven, using his strength to knock the wolf off even though it felt like hitting a brick wall with his shoulder. Bothered him a little; picking up Raven he stared at the wolves with a smirk. “If you do not mind. Unlike you, there are people here who do not run at the same speed as us. And I rather not get caught by humans.” Vladimir frowned walking towards the door feeling defeated as Sessi didn’t look away from David, as she heard Vladimir’s thoughts of how he would solve the problem in both situations. But she knew how to make him stop, his only true weakness even though it would be evil on her part. THe wolves stared at Vladimir. They didn't even glance at Sessi when he said she was alive. Adam snarled in objection to being shoved away, but Steven snapped at him. "Let him go," He glared at Vladimir. "The boy is frightened and we have higher priorities than this selfish scum. Let him be for now." The whole pack looked at the leaving couple together, a promise to even the score in their hearts. They relaxed once he'd left, but Megan kept a wary gaze on the door. "Adam," instructed Steven politely. Adam obediantly leaped out through the broken window and took off to who knew where. Steven walked over to David who held Sessi in his arms, still seate on the floor. "David..." he said softly. "It is time to go. Say goodbye to your mother, you cannot come back." David looked up acros the floor to where the body lay, now with a cut on its neck. "That's not my mother anymore," he whispered and hugged Sessi tighter to him in reflex. A tear trickled down his cheek. Steven nodded in understanding and walked towards the door. "It is time to go. Come." Megan followed him out. David looked down at Sessi in panic. THe wolves frightened him and he didn't know if she knew more than he. Vladimir and Raven left without another though even with the insults. Hearing what the wolf said about David saying good-bye to his mother. That is something she wish she could give David but hearing him say what he did and shed a tear made her sad. Lifting up her hand she wiped it away and then looked at the wolf. “May I go with you? I don’t want to leave David.” Sessi asked hoping the answer to be yes, she hugged David wishing that none of this had happened. Too much pain for one day as they both were having the worse weekend imaginable. The wolf, Steven, stopped near the door. He didn't look back, but considered the question. "For now." He exited the house and trotted into the yard to wait for David and Sessi. David didn't dare be relieved. These wolves may have saved them, but they could kill him just as easily. He eased himself up, pulling Sessi with him. "Are you okay?" he asked her worridly. His voice didn't sound quite right and he hated it. "What did he do to you?" He glared hatefully at the door as if Vlad was still there. He walked out the door and paused to make sure Sessi had caught up to him. He was careful not to look at his mother. The wolves left the room and Sessi stood there with the help of David before he started walking towards the door. Looking back at his mother, she wanted to give him back what he lost. Wanting to do something to make things better to where he didn’t have to leave his old life, but it was too late. There was no blood in the body and it had been dead for too long. Remembering David’s questions, Sessi walked up to him. “Shocked me. Tortured me like he does.” Sessi responded calmly. She nudged him out the door picking up the black bag along the way. Her muscles were still a little stiff from the jolt but she closed the door. Staring at the wolves, she rather not be running with a pack of dogs but as long as David was going she is going. “Great going to be running with dinner.” Sessi joked with a sigh. “I’m joking.” She raised her hands trying to lighten the mood. David went out of the house, urging himself not to cry the whole way. He was angered that Vlad had shocked Sessi. He didn't laugh at her joke, mostly because he was busy imagining how hard he could shock to do that to Sessi. The jolt he'd received had been nothing in comparison. Steven, however, had been listening and made a chuckling sound, more at Sessi than at the joke. Megan appeared from around the corner of the house and trotted past them both. "Watch it girl or you'll be the one on the menu." She came up beside Steven, but respectfully kept herself a stride behind him. They led the way, Adam still nowhere to be seen. David followed, trying to keep pace. The wolves weren't moving at a very fast speed, but for David, he would have needed to sprint to keep up. Megan rolled her eyes to the sky and stopped. "Hold on, boss." Steven slowed as well. Megan approached David without hesitation. She jumped up to put her paws on his shoulders. He jerked back, but he claws dug into his sweatshirt. She leaned in to whisper something in his ear. Angry tears leaked down his cheeks as he listened, but he made no effort to get her away from him. As if frozen, when she placed her paws back on the ground and turned to follow Steven, David was still standing quite motionless, crying silently. The wolves started moving again. He glanced at Sessi and a look of determination and pain spread on his face. When he moved to keep up with the wolves again, he found that he could do so easily. Sessi saw David move quicker when the female wolf said something. She didn’t like it when David looked at her with that face. Looking at Megan she had half a mind to force herself to get into the wolves head just to figure out what Megan said. Frowning, she ran next to David. “What did that girl say?” Sessi asked with a frown. She kept up with the wolves and with David as though nothing was going on. She bottled up her heartache and pain like she always did, and felt at a disadvantage right now. “The dinner comment wasn’t towards you David. It was towards the wolves. And that wolf doesn’t need me to watch it.” She winked at him as she ran.